Do you want to import and export WordPress users from one website to another? This could be really helpful when you are merging multiple sites and want to automatically shift all users from existing websites. 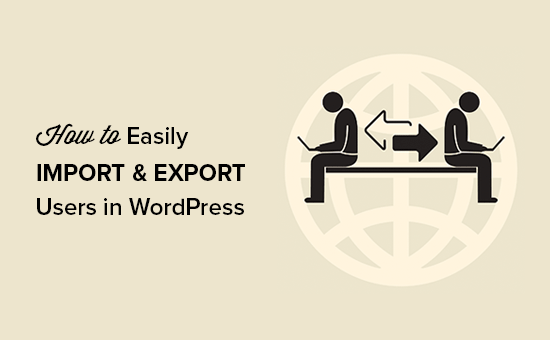 In this article, we will share how you can easily Import Export WordPress Users. Why or When You May Need to Import and Export Users in WordPress? When you purchase a website and want to merge the content and user base. When you want to consolidate two sites and merge their content and user base. When you want to import all users into an email list or your CRM. On large multi-author sites or a membership site in WordPress, each user profile has tons of useful data (like profile photo, bio information, social links, and more). While you can surely ask them to recreate their profile, it’s inconvenient and not an ideal user experience. Let’s take a look at how you can easily import and export users from one WordPress site to another. First thing you need to do is install and activate the Import Export WordPress Users plugin. For more details, see our step by step guide on how to install a WordPress plugin. Upon activation, you need to visit Users » User Import Export page and scroll down to the export section. On this page, you need to select a user role to export from your website, select fields that you want to export with the user, and more. By default, all user fields will be exported. If you don’t want to export a specific item, then you can simply uncheck it from the columns section. After selecting the settings, you need to click on the Export button. It will save a CSV export file in your computer. You can use this file to import users into another WordPress site. This step will also require the same Import Export WordPress Users plugin that we used above to export users. Make sure that you have this plugin installed and activated on the site where you want to import users. Next, you need to visit Users » User Import Export page and click on the Import Users button. On this page, first you need to click on the Browse button and then select the CSV file you want to import. 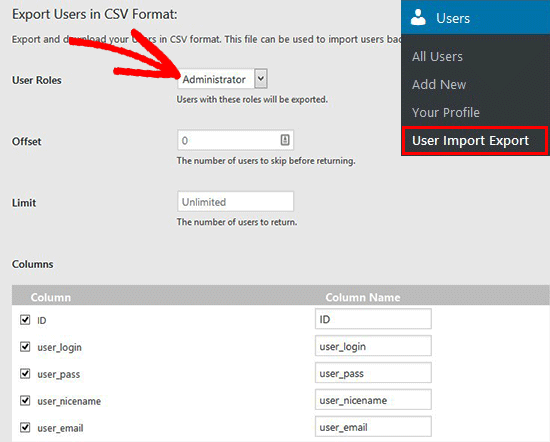 After selecting the CSV file, you need to click the Upload file and import button. Once done, you will see a success message with details on how many users imported, status message, and more details on the process. The plugin will not only import users, it will also automatically assign them correct user role and fill in other profile settings. We hope this article helped you learn how to easily import and export WordPress users. You may also want to see our guide on how to track user engagement in WordPress.